Every once in a while, a scent comes along that's so intoxicating, it makes you want to douse your entire body it. (You'll likely remember the Bath and Body Works Warm Vanilla Sugar obsession from your middle-school days.) Now, an old fragrance is making a huge comeback in the form of a fan-favorite shampoo and conditioner. 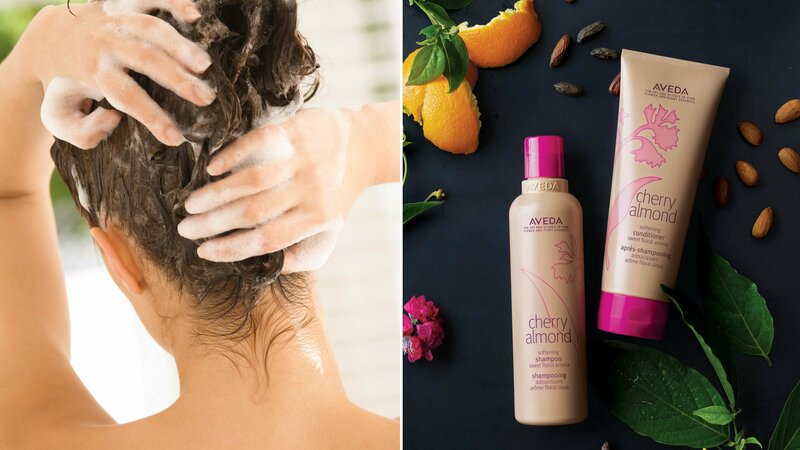 After almost a decade of being discontinued, the Aveda Cherry Almond softening line is back with a new and improved formula, and the wait list is already through the roof. Today, the brand's online store is restocking to get this best-selling shampoo and conditioner out to even more people. Aveda launched in 1978, and its mission was to use sustainability and quality plant ingredients to be effective on your hair without making a negative impact on the environment or your health. One of their first releases? A line of Cherry Almond Bark hair products, which was created in founder Horst Rechelbacher's sink and remained a brand staple for 30 years. They stopped making it in 2008, but ever since the re-release of this product this summer, fans are dying to get their hands on it. It sold out in no time earlier this month, and the wait list was thousands of people long. Why is this newly-restocked formula so coveted? For one, it's made with 98 percent naturally-derived ingredients, so it doesn't have silicones, parabens, mineral oils, or phthalates. The sweet-yet-complex cherry almond scent is also completely natural and is crafted with 38 flower and plant essences instead of synthetic additives. If you're concerned with environmental impact, the line is vegan, cruelty-free, and manufactured entirely using wind power and renewable energy. The Cherry Almond shampoo is made using babassu and coconut-derived ingredients, which effectively cleanse hair without stripping the scalp's natural lipids. As a result, hair feels extremely soft and weightless, but still full of shine. It's also color-safe, works on any length of hair, and reviewers say it "smells like heaven" and leaves their strands shiny, frizz-free, and light. Reviewers also can't stop raving about the Cherry Almond softening conditioner, saying that their "hair has never been [so] soft and bouncy" and it offers deep-conditioning benefits "without a heavy greasy feel." This one's made with cherry blossom extract, almond oil, and shea butter, all of which offer superior slip, hydration, and detangling without weighing you down. Maybe you've been a fan of the line for years, or maybe you're excited to see what all the hype is about, but either way, it's only a matter of time before Aveda's Cherry Almond products sell out again, so jump on this one fast.